In my last post I wrote about the unconference session on Multilingualism in DH that took place during DHSI. This week Martin Grandjean published some really interesting, though as he calls them “unhappy”, results regarding rates of acceptance according to language in DH2014. His findings show that even though the call for papers for DH2014 was published in 23 languages, submissions were done in only 6 languages other than English. Even more shocking is that acceptance rate was about 50% lower for non-English language proposals than it was for English language ones. 5. Ce n’est pas un problème de langue, mais de réseau de cooptation. Dans certains colloques, il apparaît de manière évidente que le choix des keynote speakers et d’une partie des panelistes découle plus du réseau personnel des membres du comité que de choix scientifiques. En l’occurrence, la composition très anglophone du comité expliquerait pourquoi les chercheurs retenus le sont aussi en grande partie, puisque faisant partie d’un cercle plus ou moins large autour des décideurs. DH2014, as the biggest and most important international conference in the field, carries a larger responsibility to be inclusive of practitioners around the world; while smaller, local or linguistically focused ones, though open to other communities, usually concentrate on promoting the field in their language and their context. Two very different objectives to have in a conference. Still, it would seem that the pattern is not exclusive to DH2014. 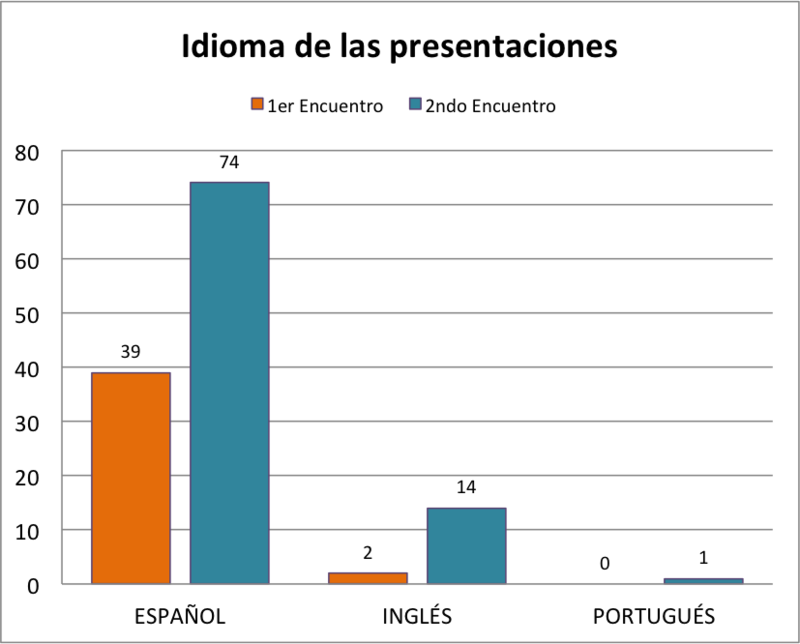 Multilingual representation in the recent 2EHD in Mexico City, as can be seen in the chart below, is not that different to Grandjean’s results. Even when the call for papers was available in 6 languages and GO::DH contributed to the organization, only 16% of the presentation were done in a language other than Spanish—up from only 4% in the first EHD . Furthermore, only English and Portuguese were represented. This parallelism suggests precisely that though efforts are made to attract a stronger multilingual presence to DH conferences in widely distinct contexts and scales, it hardly happens; at least not to the extent that one would wish. Happily, from the 2EHD data, it also appears to be increasing. We could then actually say that different conversations around the global DH’s don’t cross, but do touch briefly at times. 6. Quand on est bon, on choisit l’anglais. Si le chercheur sait ou croit savoir que sa communication est de bonne qualité, il pourrait souhaiter la rendre accessible au plus grand nombre, raison pour laquelle les papiers soumis en anglais (par des non-anglophones) seraient en moyenne de meilleure tenue que les autres. Par ailleurs, le fait d’être capable de communiquer en anglais est, pour un chercheur non-anglophone, un indicateur de ses compétences et de son “internationalisme”. This is partly what I referred to when I talked about audiences and sources. What I think the similarity in results suggests is that we definitely have different conversations in distinct DH contexts, and that language choice is dependent on that. At least from the surface it seems like a good thing, that the field can be scalable in that way: projects have a certain relevance in a given context and a different kind of relevance in another. I’m going to venture and say it is pretty safe to assume that DH2014 presentations in English by non-native speakers have been (or will be) presented in their original language in other local conferences. The implication of this is that in its original language a particular project or research has its outlets. In that sense, yes, the purpose of taking projects to DH2014 is to internationalize them, to let others outside of their particular local contexts know about them. Indeed, this is proof that most of us have adopted English as the lingua franca in DH, but it seems to me that it can also be suggestive of how language specific conversations are taking place elsewhere. Ultimately, it is indicative of the importance of local conferences to foster certain conversations, and the relevance of international ones to promote other ones. This still poses another problem, is the audience attending these “translated” presentations diverse or are they the same who have listened to/read them in “the original”? If non-English speakers are putting the effort to internationalize their work, it is because they (we) care about having a diverse audience and different conversations about their projects, much more than having the call for papers available in tens of languages (which, though immensely valuable, should not be an end in itself). Again, the unresolved issue is the matter of sources, conversation exchanges, and scholarship diversity. Great efforts put towards multilingualism in DH, like the GO::DH “I whisper_______” pins coming to DH2014 are aimed at inviting everybody to come and speak in their own language at international conferences, and foster collegiality and helpfulness among colleagues. There is, still another way of contributing to this, going and listening to the diverse, though small, non-English presentations (there will be someone who can whisper in English too, I’m sure) and generate exchanges and conversations. In my opinion it will be this kind of scalability of the field in different contexts, that will help remedy the “unhappy” results found by Grandjean regarding acceptance rates and multilingual representativity. More 2EHD metrics are coming soon at the RedHD blog.